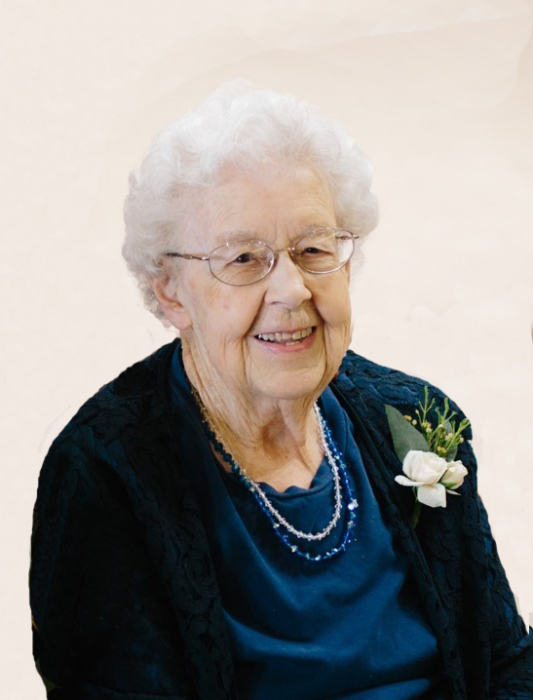 MaryAnn Ellis, 94 of Evansville died peacefully with her family at her side Thursday, April 4, 2019, at the Evansville Care Campus but lives forever in the presence of Jesus her Savior. MaryAnn Ellis was born on March 9, 1925, in rural Elbow Lake, Minnesota the daughter of Guy and Ruby (Theobald) Flint. She graduated from the Elbow Lake High School in 1943, attended St. Cloud Teachers College receiving her Teaching Certificate. MaryAnn first taught in Hoffman and Glenwood. She then began the Evansville Public School kindergarten program as its first teacher. After beginning the program, she went back to school to receive her Kindergarten endorsement. She taught kindergarteners in Evansville for 27 years and retired in 1987. Children always brought her great joy. Her students and later her grandchildren and great grandchildren never failed to bring a smile to her face. MaryAnn married Howard Ellis on June 11, 1948, at Grace Free Evangelical Church in Elbow Lake. They made their home on a dairy farm in Grant county’s Erdahl Township. MaryAnn was a very capable homemaker. She became a wonderful cook and was an exceptional baker. Even in her later years people found her caramel rolls to be mouth-watering. She enjoyed her garden into her 80’s. Her family was kept well supplied with fresh vegetables and fruit, in season and during the winter from what she preserved…even dill pickles! She also found time to enjoy nature found in abundance on the farm. Birds, wildlife and wildflowers pleased her and she shared her delight with her family. Sewing, baking and caring for her flowers especially roses and violets were ways she found to show her love for others. Howard and MaryAnn moved into Evansville from the farm in 1986. They became residents of Evansville until Howard’s death in 1990. MaryAnn stayed in Evansville until 2011 when she moved into the VartHjem apartments in Elbow Lake. She moved to Evansville Senior Living in August of 2018 at age 93. In her early twenties she trusted Jesus as her Savior. The rest of her life she lived for Him. She was a longtime member of Grace Free Church where she taught Vacation Bible School and Sunday School. While living in Evansville, she attended Faith Lutheran Church. Wherever she lived God’s Word and prayer was important to her. In retirement Bible reading and prayer each day became her life work. She loved her family and her neighbors and prayed for them regularly. She was leading a weekly Bible study while living at VartHjem. Her family is very grateful to the staff at Evansville Care Center for their loving care and Hospice of Douglas County for assisting in making her final hours comfortable. She is survived by one daughter, Barbara (Allen) Holtberg of New York Mills; two sons, David (Barb) Ellis of Fergus Falls and Dean (Vicki) Ellis of Ashby; nine grandchildren, Michelle Ellis, Jennifer (Ryan) Nordlund, Timothy (Julie) Ellis, Errin Holtberg, Andy (Missie) Holtberg, Matt Holtberg, Grant (Kaylyn) Ellis, Lynn (Larry) Martini and Naomi (Riley) Myers; twenty great-grandchildren: Mallory, Mckenna, Micah, Olivia, Levi, Annie, Luke, Elijah, Brielle, Charlotte, Caroline, Kendra, Avery, Matea, Walter, Fox, Natalie, Miley, Isla, and Felix; a sister, Alice Lorenz of Durango, Co; two sisters-in-law, Delores Flint of Owatonna, MN and Sue Flint of Maryland; and by numerous nieces, nephews, relatives and friends. MaryAnn was preceded in death by her parents, step mother Elta Flint, husband, Howard Ellis, siblings, James (Hulda) Flint, George Flint, Charles Flint, Helen (Oscar) Perry, Ruth (Donald) Swenson and Ivan Lorenz. Funeral Service: 11:00 AM, Saturday, April 13, 2019, at Grace Evangelical Free Church in Elbow Lake. Visitation: one-hour prior at the church.